Well what an experience you gave us. Craig and I had an absolute ball. First lets start with your organisational skills. Spot on mate nothing was left to chance and we always felt you were one step ahead of the game. We were literally thrown in the deep end at the start, I mean how many people can say they left on the start of a trip in rain that would put Darwin to shame, with two feet of water lapping at the workshop doors as a result of rain from a typhoon, on a bike we had never ridden, in a place that we didn’t know, with traffic conditions that none of us had ridden in. That’s when the trip became an adventure. Next was your grasp of the Vietnamese language, this is certainly a big plus, in the remote areas that you took us to and was a big plus in the selection of our meals and accommodation. Then there is the ride, what a beautiful part of the world ,Vietnam is certainly one of the most beautiful and interesting countries I have visited and the people are so friendly and happy to see you. The scenery is breath taking and with every turn in the road, there’s something new and yes sometimes scary, i.e. ox and cart, heard of buffalo, big scary old Chinese truck with the mandatory horn blowing or a beautiful surprise like 20 smiling, waving children so delighted to see the men with the cool helmets [motor cross] or a man on a scooter waving an obviously poisonous snake at us when we passed him. 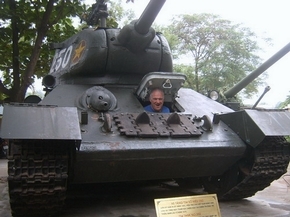 Now there is the matter of the bet we had and yes the T34 tank is the number one position holder in the Top Ten. They are just like THE MINSK Bikes. NUMBER ONE in Vietnam. They are tough, reliable, easy to start, easy to ride, on the road or in the dirt and can take you anywhere and when something did go wrong , [a rare occasion ] parts were cheap and skilled mechanics were not a problem. They were a pleasure to ride.